learn the process behind publishing, which is something I wish I had myself when I got started. believe it myself either, but it is true! 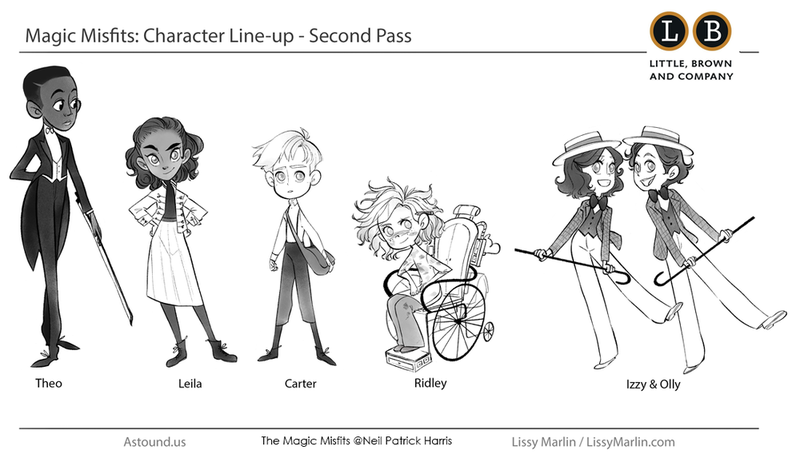 When I got the very first brief of Magic Misfits back in 2015 the story and characters were completely different. 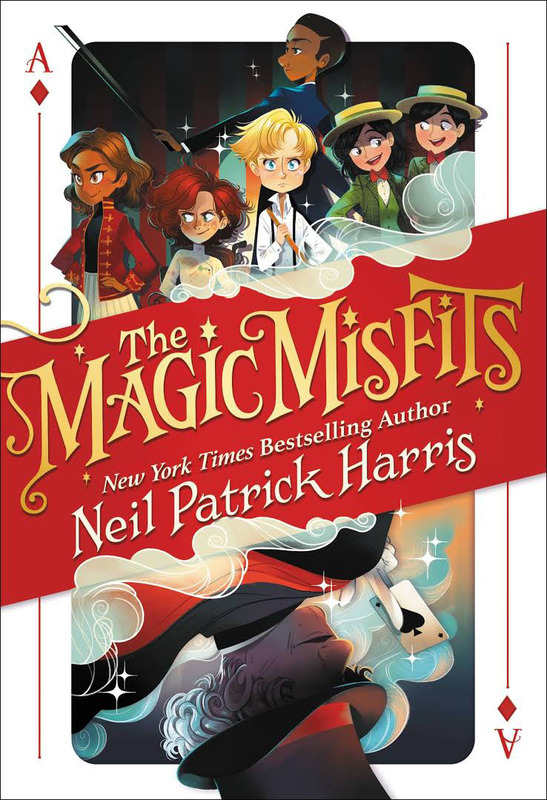 At that time, the three main characters were called Theo, a magician and violin prodigy who was small for his age (8 y/old), and Oliver and Isabel, 12 year old comical twins that wore the most outrageous costumes. The brief called for explorations on the characters as well as the interior view of Vernon's Magic Shop. Having the story set in the United States during the 1940~50s was definitely challenging. style and perhaps spark some ideas on enviroment and story. changed between feedback rounds and so did the art. After a number of revision rounds, the story evolved and characters increased in numbers. Carter was introduced as main character. The concept of Theo remained the same except he is now portrayed as a refined African american child prodigy. 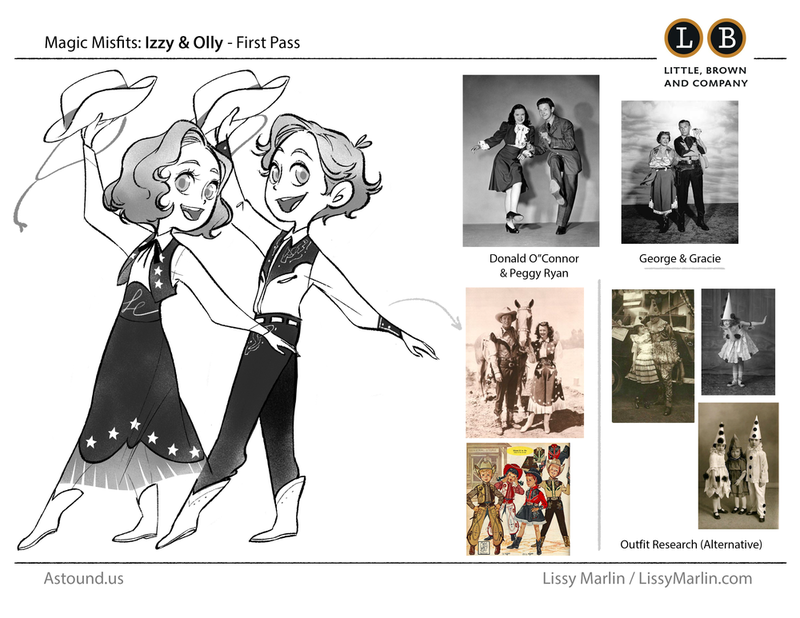 Oliver and Isabel were now performers called Izzy and Olly. And, finally the character Leila, an escape artist, and Ridley, an inventor, were introduced. This is definitely my favorite part of the process. During these rounds I immersed myself in the 1930s~50s by watching a number of movies from the era. I also researched books and magazines that talked about actors and fashion style from this period. This informed my mood-boards and reference materials for each character moving forward. Under the Art Direction of Neil Patrick Harris himself and the lovely team at Little, Brown we landed on a final line-up that coincided with Mr. Harris's vision for his story. 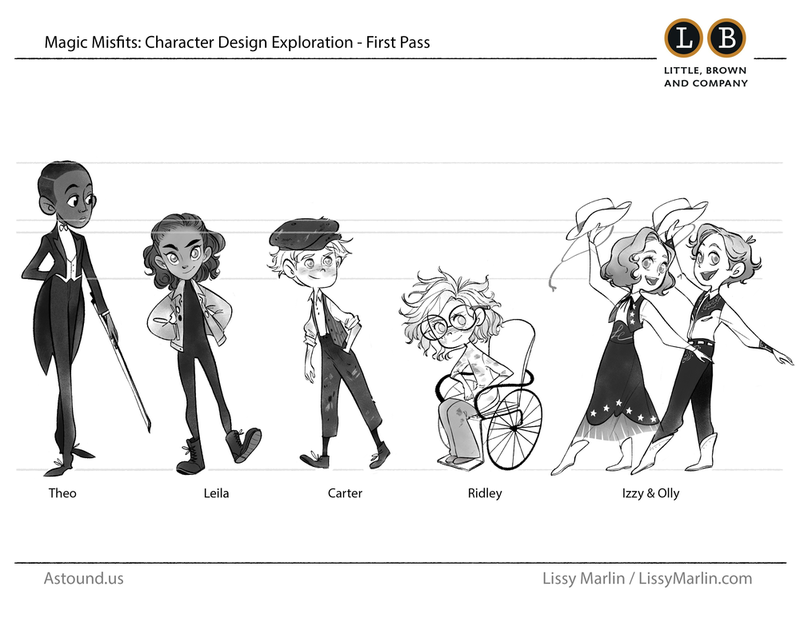 With this approved, the team was ready to move on to working on the cover for Magic Misfit's: Book 1! Usually, before working on any interior illustrations for a book, one tackles the cover before anything else. This helps the publisher as having the cover ready months in advance is certainly an asset when promoting the upcoming book to the public. This was no different for this Magic Misfits. 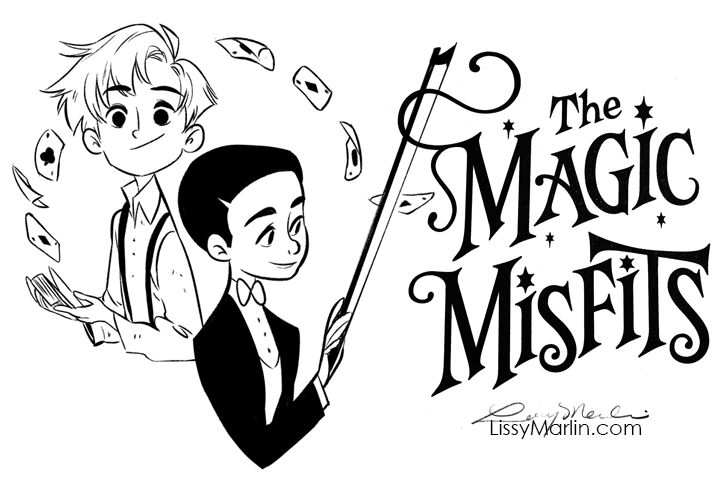 The concept of Magic for this story is more "show business" than "wizardly" and so the first concepts of the book played on the Magician concept with iconic items such as top hats and playing cards. be the winner across the board. With the prospect of three other titles coming down the pipeline, the general idea of the card concept idea was that it could also play as a recurring concept for all titles. After cleaning up the original sketch and fixing up the position of the characters and overall composition of the image I went ahead to do color studies before moving on to finals. Inspired by the "vintage" feel of the previous mood boards my color studies looked very different from the current version of the cover. One important thing that changed from the sketches, besides the color palette, was the increase of age on the characters. Originally, the kids were younger but in order to fit an older target audience everyone got a second style pass on the cover and, eventually, all interior illustrations moving forward. After completing the book cover, the wrap jacket was next on the list. This was actually completed after all interiors were finalized months later. Under the fantastic art direction and design input from Karina Granda and Mr Harris, the book cover and wrap jacket was successfully completed. process behind this magical story, let's take a look at the interior illustrations!